Eager to showcase themselves as innovative and future ready, cities worldwide are implementing a variety of new technologies intended to make city life more efficient, convenient and sustainable. This development, often framed as the “Smart City”, has the potential to transform local governance, because vast data collection might better inform governmental decisions. Many cities also partner with private companies in their quest to become “smart”, hoping to capitalise on outside tech knowledge to make up for a lack of in-house expertise. At the same time, digital platforms are transforming how space is used in the city. The digitalisation of large parts of city infrastructure raises new questions of privacy, data governance and (digital) design that have historically not been part of city planning, architecture and local governance: How can technology meaningfully improve citizens’ lives? What responsibilities does a smart city have towards its residents? Who are the City Makers of the digital age? Please register for the event in advance via the registration form below. Marleen Stikker, co-founder of WAAG, an Amsterdam based interdisciplinary non-profit media lab and research institute. In her work, she aims to put social values at the core of technology by creating and promoting open, fair and inclusive innovations. She has been active in the field of internet and digital activism since the early nineties. Beate Albert, head of the Berlin Partner Smart City Unit. She has worked with Berlin Partner for 15 years. Prior to her current position she worked as a project manager in location marketing, foreign business promotion and smart city development. She holds a degree in translation studies from Humboldt University. The program is introduced by Christian Grauvogel (HIIG) and Prof. Elizabeth Sikiaridi and Prof. Frans Vogelaar (Hybrid Space Lab). 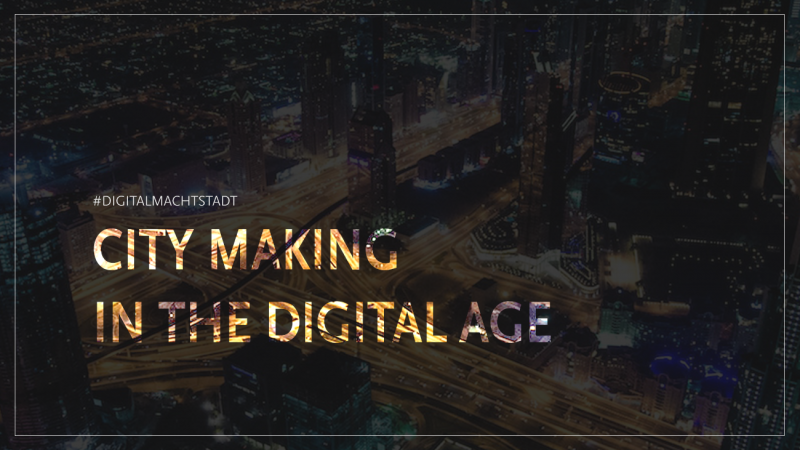 This event is part of the digital macht stadt series, which aims to bridge the gap between data and privacy experts, urbanists, architects, city makers, civil society and governance. It will facilitate a transdisciplinary dialogue that investigates developments at the intersection of cities and digital technology: The future of urban mobility and public space, new forms of space utilisation in the digital society, circular city, climate adaptation, and healthy cities.